Employment has changed dramatically in the last few decades with the onset of neoliberal globalization. This change has become the objective of inquiry from different perspectives, such as development studies, labour economics or industrial relations, focusing on different units of analysis. 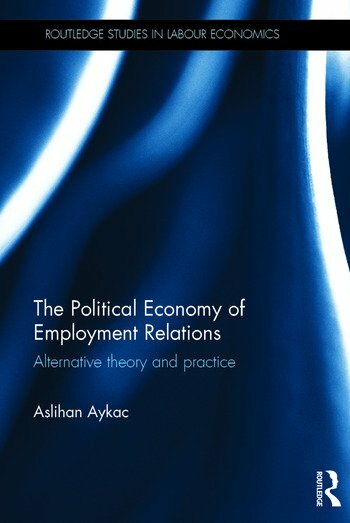 The Political Economy of Employment Relations provides an exceptional contribution to existing literature by presenting alternative theory and practice on employment relations. It is within this critical theoretical intervention that solidarity economies emerge as a unique theoretical construct as well as a unit of analysis to expose the alternative paths that employment relations may resort to against the contemporary challenges of neoliberal globalization. This book analyses globalization, global economic crisis, and issues of work and labour from the point of view of the developing world, presenting local case studies from countries including the USA, India, Spain and Greece, and outlining alternative approaches to global challenges. This volume has relevance to those with an interest in industrial relations, sociology of work and occupations, labour economics and development economics. Aslihan Aykac is Associate Professor in the Department of International Relations at Ege University in Izmir, Turkey.